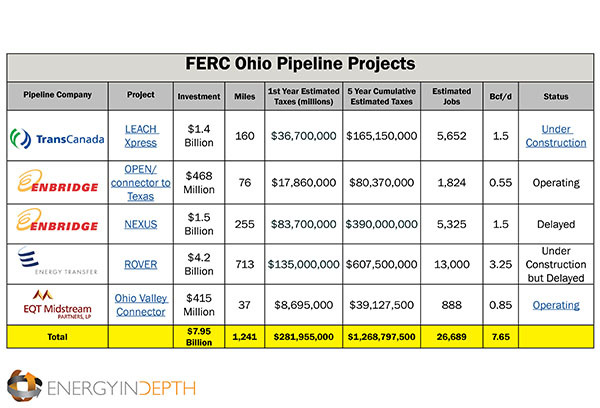 The first of five new major interstate pipelines to go in service in Ohio has yielded more than $14 million in tax revenue to three Ohio counties this year, according to public documents obtained by Energy In Depth. Jefferson, Belmont and Columbiana counties, which make up 96 percent of the total miles of the Ohio portion of the Texas Eastern Transmission pipeline project (TETCo), otherwise known as the OPEN project, have reported tax payments from the line’s first year in service (2016), which the counties received payment for in 2017. EID recently reported that once all five of the lines are in service and through the first five years of operation, Ohio will receive $1.2 billion in local tax revenues. When it comes to oil and natural gas development and the vast economic benefits that come to communities where activity is occurring, residents are frequently initially skeptical of tax revenue and economic impact projections made by companies and trade groups. In fact, one superintendent of a local school slated to receive millions in taxes from pipelines told EID, “I’ll believe it when I see it.” To that point, public records requests to county treasurer and auditors’ offices show beyond a shadow of a doubt that millions are pouring into local communities in Ohio. The tax revenue collected from this one pipeline will go directly to the local community where the pipeline is located and is a direct and immediate windfall to fire and police departments, local schools, governments, and developmental disability services, underscoring how much Ohio has to gain from the additional pipelines yet to be constructed or put into service. Jefferson County, for example, has reported that 60 percent of the OPEN pipeline money will go to their schools, with Buckeye Local receiving $595,772, Edison Local receiving $1,651,209, and Indian Creek receiving $706,778. This news comes as these same schools have reported revenue cuts from the state, declines in population, and tax loss from coal power plant closures. What’s more is that the Rover Pipeline will bring another 20 miles of pipeline construction activity to Jefferson County, and with it millions more in tax revenues. Of course, without drilling and production, none of these pipelines or the tax revenues from them would be possible. And in Jefferson County, where natural gas production grew by 587 percent from 2015 to 2016, the county can expect to see a surge of new tax revenue from property tax paid on production as well. Similar to this new revenue from pipeline taxes, our research found that since 2011, real estate property taxes from oil and gas production went from practically nothing to better than $200,000 per year for the county. This $14 million in NEW tax revenue to just three counties in only one year is not a projection — it’s a matter of fact, as we have clearly shown. When we consider the natural gas lifecycle, including the tax revenues that come from production of natural gas, pipelines and other midstream activities, and end-use of natural gas such as natural gas power plants, taxes from the oil and gas industry really start to add up and positively change lives.